I did a post last month about making this table runner. Mary sent me these pictures just this week. I thought I would share. My local guild, The Rippers, had a “Christmas Gift Challenge” where we were given a bag with one piece of fabric and an information slip with a member’s name and preferences. We were to add fabrics to what they gave us and make a gift for them for our Christmas Party tomorrow. The fabric in the bag that I got is what I used for the background and backing on this table runner. 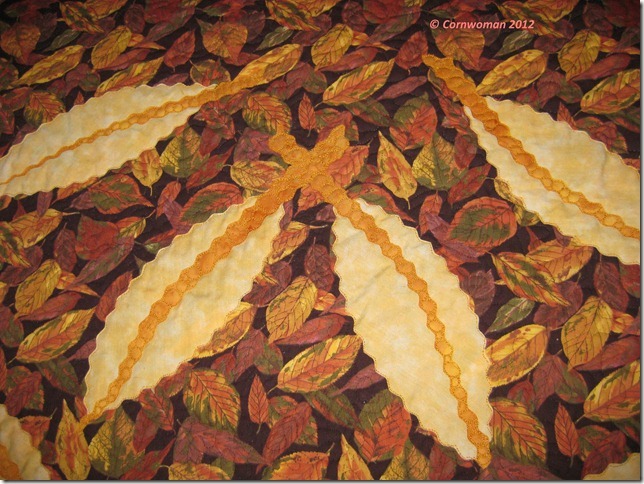 If I were to make one without the restriction that the challenge placed on me, I would have made it either from hand dyes or batiks plus I would have made the leaves “fatter”. Thanks again for the pattern! I enjoyed making the table runner and it was a perfect fit for the fabric that I was given to work with. She did a beautiful job on it and I am sure it will look gorgeous on the table.